In August of 1917, J. Best and George B. Lewis purchased the Joseph Quest Undertaking Company. The business was located on the corner of Church and Main Streets directly south of the Post Office. For several years the concern also operated a furniture business in addition to the mortuary. In 1929 the partnership was moved across the street to the Savoy Building. This building was razed in the late 70’s to make way for the new Palmyra State Bank. Sons of the founders, John B. "Jack" and George M. Lewis, constructed the current building located on the corner of Hamilton and Main Street in 1964. Both Jack and George have served for over 50 years in the funeral industry. Today, the grandsons of the founders David and Steve Lewis continue to operate the family business. An addition and complete renovation of the current building was completed just a few years ago. Lewis Brothers also operated ambulance service in Palmyra and Philadelphia until the Marion County Ambulance District was formed in 1974. For three generations and over 95 years the Lewis families have served Palmyra and the surrounding communities with caring, dignified funeral services. We welcome you to our web site and encourage you to browse the many offerings and information accessible here. We are available to answer questions 24 hours a day and invite you to contact us by phone or by e-mail. Founders-J. Best Lewis, left, and George B. Lewis, right. In 1917, J. Best Lewis and George B. Lewis, brothers, formed the proprietorship Lewis Brothers Furniture Dealers and Undertaking. The brothers moved to town from the family farm and established the quiet and conscientious business to serve their community. They strived to provide the highest level of service and attention to detail with every family with whom they had the honor to serve. Later, the second generation, John B. "Jack" and George M. Lewis returned to the family business. 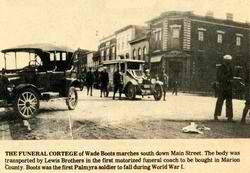 Although the furniture venture had dissolved, they remained very busy tending to the communities needs with local ambulance service in Palmyra, Philadelphia and neighboring areas. Both Jack and George, respectively, served in the funeral trade for over 50 years. 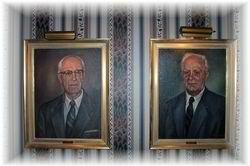 Today, David M. Lewis, Steven W. Lewis, and James J. O'Donnell continue their forefathers' dedicated service to the families of northeastern Missouri. They hope to follow in their father’s and grandfather’s footsteps providing meticulous attention to the needs of the friends and families they serve. Our motto: "Our family serving your family since 1917"